Then needing Mt. Kaweah, a SPS Emblem peak, I scheduled and climbed these peaks for my now, presently completed, list accomplishment goal, the SPS Senior Emblem. Mt. 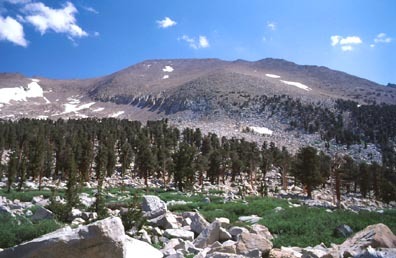 Kaweah is the presumed, highest peak in the southwest part of the High Sierra. Only one taker joined me for this five day backpack activity. We hoped to get at least 4 listed peaks, but we had to settle for three. A previous local chapter trip saw the ascent of Mt. Kaweah (a.k.a. Big Kaweah) with a few attempting, unsuccessfully, Black Kaweah. That one is a highly coveted summit. I was determined to do as well or better. We carpooled to Mineral King, where, in the morning, we took the Monarch Lakes/Glacier Pass trail. This climbs some 3,400 vertical feet to Glacier Pass, which is a sand slog for the last several hundred feet. I had scouted this trail earlier in the year, so pretty much knew the way. We descended on a snowbank to Spring Lake, our first night's camp. Mosquitoes were thick, but it is a beautiful campsite. The rock face of Sawtooth Peak and a sight of the alternate route, Hands and Knees Pass, presented themselves. Our next day's itinerary was to get to base camp for our most important peak. We headed cross-country north from Spring Lake. We found a slight use trail, for a short section, to get to the Black Rock Pass trail. This trail switchbacks nicely up to the pass at 11,600+. The rewarded view of the Kaweah Spur is breathtaking. We descended on the trail to our base camp at one of the Little Five Lakes. We spoke with the backcountry ranger, who lived in a tent nearby. He spent his days, then, fighting a fire singlehandedly, smoldering to the south. Having nothing else to do that day, we made an attempt on Mt. Eisen (12,160') from the east. Getting to what the ranger called Long Lake, we couldn't discern the class 3 route that should lead to the top. We went a bit further, but saw that we might exhaust ourselves bagging this relatively unimportant summit, in lieu of our main goal, Big Kaweah. So, we returned early to camp. In the morning, on our biggest summit day, the clouds were building up early. I could only hope that the weather would hold. We took the good trail down into the Big Arroyo and crossed the creek without problem. Connecting with the High Sierra Trail, it led us up to a small tarn on the west slope of Big Kaweah. We simply headed up cross-country to the top. The two thousand foot vertical climb is mostly class 1 or 2 sand and rubble. We came to the summit as clouds were moving in. There was still a lot of snow on the peaks all about. Two other hikers had beaten us, by minutes, to the first register sign-in for the year. We enjoyed the view, and then started back down. Some peaks to the north do look higher. I shot a photo (right). I wondered if we were on the right summit! I had a nice glissade on a snowfield, passed by a spring, then through some scenic forests, and we came back to the HST, and then headed back to camp. I had a look at Black Kaweah. The weather had held, although some big thunderheads loomed over to the west. With our main goal accomplished, we rested well at camp. But still full of energy, on our fourth day, we chose to climb Mt. Lippincott (12,260'). We hiked a short ways, along the same trail toward the Big Arroyo, then headed cross-country again to gain the southeastern slopes of this peak. I ascended a large snowfield, then, tiring of the mushy snow, took some talus slopes to the summit. My companion chose to stay on the snow. The usual vistas were great. After this success, we packed up camp and headed back over Black Rock Pass, and then back to Spring Lake. There, we had a short, light rain and another beautiful sunset. The next day's goal, Sawtooth Peak, loomed above us. Again, the mosquitoes were bad here, but we used repellant. On our last, fifth, day, we climbed back up to Glacier Pass, with a curious marmot inspecting us closely. 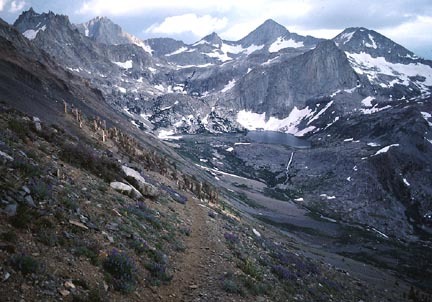 From near Glacier Pass, a sand trail leads further, upward, to Sawtooth Pass. 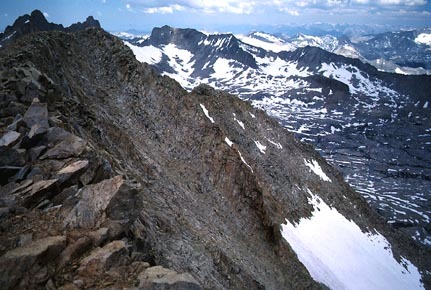 From here, we scrambled cross-country over large talus blocks to the summit of Sawtooth Peak. This had more great views, and we lingered on this fine summit. I read later, in my SPS newsletter, that a register I placed was almost full after a month. We descended back to Glacier Pass and our slightly hidden packs, then took the unmaintained Glacier Pass Trail back to the cars. Our finish was at about 5 p.m., and we had a long drive home. As we drove through the Central Valley, we enjoyed a near continuous fireworks display from a series of towns. We must have hit the time just right! This trip probably entailed more gain and miles than many regular hikers would ever do in one summer. To climb Big Kaweah alone by this route would total some 12,000' gain, round trip. I haven't calculated what our stats were, but I'm sure they would be impressive.